In this interview with Nicole Wilde, certified dog trainer, canine behavior specialist and author, learn how wolf behavior help us understand our pet dogs better. I met Nicole in 2007 at one of her outstanding dog training seminars about helping fearful dogs. I was studying to be a certified dog trainer myself and her words and books really helped me understand many of the concepts I apply today. 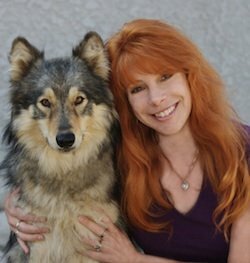 Read along to learn about her story, her tips and knowledge of behavior both in wolves and dogs. Nicole Wilde is recognized and respected as an authority in the field throughout the world. She has written 9 dog training and behavior books and also educates pet owners and professional dog trainers through her popular seminars. Learn more by reading Wilde About Dogs, Nicole's own blog. As a certified dog trainer and canine behavior specialist, Nicole Wilde uses and promotes reward based methods to help pet owners overcome difficult behavioral problems such as separation anxiety and fear aggression. We asked Nicole to answer a few questions for us, and we think you'll find her answers helpful and interesting. Enjoy! 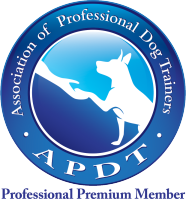 1- What is your story on becoming a certified dog trainer, behavior specialist and expert? I don’t consider myself an expert, but I am fascinated by canine behavior and constantly strive to learn more. I did some dog training part-time in New York where I grew up, and I continued when I moved to Calfornia. I also volunteered with the Los Angeles city animal shelters, and became a volunteer coordinator, training other volunteers and working with the dogs. The hands-on experience of working with shelter dogs is invaluable, and I would strongly suggest it to any trainer who wants to improve their skills. I also got involved with a rescue center for wolves and wolfdogs, and eventually became Executive Director. As we could not legally adopt the animals back out, we were really a sanctuary. I specialized in socializing the very fearful residents and rehabilitating them to where they could feel comfortable living out their lives. Oh, yes, and three of the residents ended up coming home to live with my husband and me! Phantom, a pure wolf, Heyoka, a mostly-wolf, and Sequoia, a Samoyed-wolf mix were with us for ten years until they all died of old age (they’d been around three when we took them in). They taught me so much, and I had a strong bond with all three. Nicole Wilde with Heyoka (left) and Sequoia (right). All three surely look happy to be together! I’d been training dogs part-time, but I also spent a lot of time doing training free of charge for those with wolfdogs, since we wanted them to stay in their homes. At some point I realized I ought to be training dogs full-time, since it was where my heart was. Interestingly, it was really through the wolves that my whole career took off, both in training and in writing. My first two books were about wolfdogs. Then I moved more into canine behavior, writing about topics like fear and separation anxiety, and also wrote some instructional books for dog trainers. Nowadays I mostly write, travel and lecture, and always seem to be doing at least ten things at any given time. Still, it’s always a priority to find time to keep my own dogs exercised, trained, and happy. 2- Which wolf behaviors do we still see in our domesticated hounds? Which wolf behaviors do no longer exist in our canine friends? Any breed specific differences? Probably the most obviously "wolfish" characteristic we see in dogs is prey drive. The difference is that while wolves have the entire sequence--search, eye-stalk, chase, grab, bite, kill--our dogs have truncated sequences. We've modified the motor sequence through selective breeding in hunting dogs, herding dogs and others so that they will search, stalk, and chase, but not complete the sequence. Some breeds will only search, and some will chase, depending on what they were bred for; levels of prey drive vary, of course, in individuals. Dogs and wolves have very similar communication and body language as well, although the size of a dog’s repetoire depends on breed. For example, a great number of agonistic signals can be seen in northern breeds like the husky, whereas the more neotonous breeds (those retaining juvenile characteristics) such as the Cavalier King Charles Spaniel, demonstrate fewer of these. I came across a fascinating study about this when I was doing research for my new “Talk to the Paw!” body language seminar. Nicole Wilde with Phantom clearly showing some wolf affection! I would be remiss if I did not also mention that affection is a very wolfish trait, though some might be surprised to hear that. Wolves are extremely affectionate both to select other wolves and, in captivity, to people they know well. Fortunately for us, dogs have retained this wonderful characteristic. 3- In your opinion, what are the best ways to bond with your dog? This is a great question. It always makes me sad to see dogs and owners who are obviously not a real team on any emotional level. Some people get frustrated with their dog’s behavior, and so they feel distant from them. A great way to fix the problem and have fun in the process is to get involved in a structured activity together. It could be a training class, a dog sport such as agility or K9 Nosework, or even something like freestyle dancing. What all of those things have in common is that they require the dog and owner to have solid two-way communication, and to act as a team. I have seen owners go from frustration to beaming with pride as they see how much their dog can accomplish. 4- What are the 3 most important things dog owners should NEVER do with and/or to their dogs? Never, ever use physical force! With the exception of being attacked, there is never a reason to use harsh physical corrections. There is an inverse correlation at work: The stronger the corrections a trainer or owner uses, the less that person knows about training. There is always a better way. Never force your dog to be in a situation in which he is uncomfortable. Never allow anyone, even an authority figure, to do anything to your dog that makes either of you uncomfortable. There are trainers, veterinarians, and others who should know better but still use physical force to subdue dogs. No one knows better than you what is okay for your dog, so be an advocate. State your position calmly but firmly, and remove your dog from the situation. This is a 400 page book with excellent explanations that to this day I still use as a reference. If you have a dog that destroys your home, barks incessantly, and even hurts himself while you are away, this great book will help you. It is the best book out there on this subject, very well researched and with detailed explanations to help you solve this behavioral problem. Check it out! 5- Dog Training Excellence promotes science in dog training. We always like to ask this question. I would like to see a definitive study on the effects of various training collars such as choke chains, pinch collars, e-collars, and head halters. For years, trainers have argued about the stress caused by some of these tools, but there does not seem to be much in the way of large-scale research studies available. Settling this once and for all could make a difference in the way we treat dogs, and lessen the stress we cause them in the name of training. We want to thank Nicole Wilde again for taking the time out to speak with us at Dog Training Excellence. We hope she has given you some great ideas and helped you understand your furry best friend a little better. To learn more about Nicole Wilde, her books, DVDs, seminars and Wilde About Dogs Blog visit her website at www.nicolewilde.com.